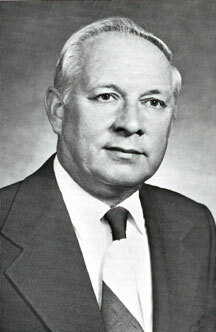 Herman Vinyard, installed as Grand Master of the Grand Lodge of Texas on December 2, 1976, is a native of Illinois, where he was born April 26, 1925 at Harrisburg. He received his education in the public schools of Harrisburg and the University of Illinois. From July 9, 1943 to June 19, 1946, he was in the U. S. Marine Corps, serving as Corporal in the South Pacific area. Grand Master Vinyard and his wife, Betty (Freda Elizabeth), reside at 620 Jonquil Avenue, McAllen, where they are members of the Methodist Church. Their daughter, Kathryn Gray, now Mrs. Gary Allan Goodnight, resides in San Jose, California. The Vinyards came to Texas in October, 1951 and after a brief residence at several Gulf Coast cities became a resident of McAllen in August, 1953, where they have since resided. He was employed by two oil companies and the Valley Monitor at McAllen before becoming associated with Tide Products, Incorporated, an agricultural chemical firm where he is presently an administrative assistant. Our Grand Master received the three craft degrees in Harrisburg Lodge No. 325, A. F. & A. M., at Harrisburg, Illinois in 1946, the Entered Apprentice August 23rd, the Fellowcraft September 20th and the Master Mason October 25th. He affiliated with McAllen Lodge No. 1110 on July 4, 1961 and served as Master in 1965-66. Since then, he has been Secretary, an office he will continue to fill while Grand Master. He has served on several Grand Lodge Committees, as District Deputy Grand Master and as Grand Senior Deacon and an elective Grand Officer since December 6, 1973. Grand Master Vinyard is a Scottish Rite and York Rite Mason. He is a member of the San Antonio Scottish Rite with the rank and decoration of Knight Commander of the Court of Honour. He is a member of St. Timothy Conclave, Red Cross of Constantine, Fort Worth, Texas. He is a member of Hidalgo Chapter No. 434, Royal Arch Masons of Edinburg and Hidalgo Council No. 353, Royal and Select Masters of the same city. He completed his York Rite Masonry as a Knight of Hidalgo Commandery No. 94, K. T. of Edingurg.